What is the first thing (or one of the first things!) that comes to your mind when you think of weeknight dinners?!? A casserole! Even better if it is a pasta casserole. And a whole lot more better if it has lot of vegetables in it – all mixed with the saucy yet stretchy cheese. It is a perfect option for a meatless monday dinner. And the best part (yes, there is one more) is that you can make this ahead over the weekend and have one less thing to think about on that particularly long day of a Monday, especially when all you want to do is to finish feeding the family and yourself and collapse into your bed. All you need to do is to get back home, pop the casserole into the oven, put on some music, pour yourself a glass of wine and pretend it is Friday. Ok ok, I think I forgot the kids. Well, I tried. Cook the pasta in salted water, take it out before it gets al dente, drain and keep aside. In a heavy bottomed pan, heat the oil and add the flour to it and whisk well till well incorporated and the color changes ever so slightly. Add the vegetable broth to it and once it thickens, add the cheeses and switch off heat. In a separate pan, heat the 1 tbsp oil and saute the spinach and broccoli till the spinach wilts. Add garlic powder, salt, pepper and the red chili flakes. Preheat the oven to 350F. 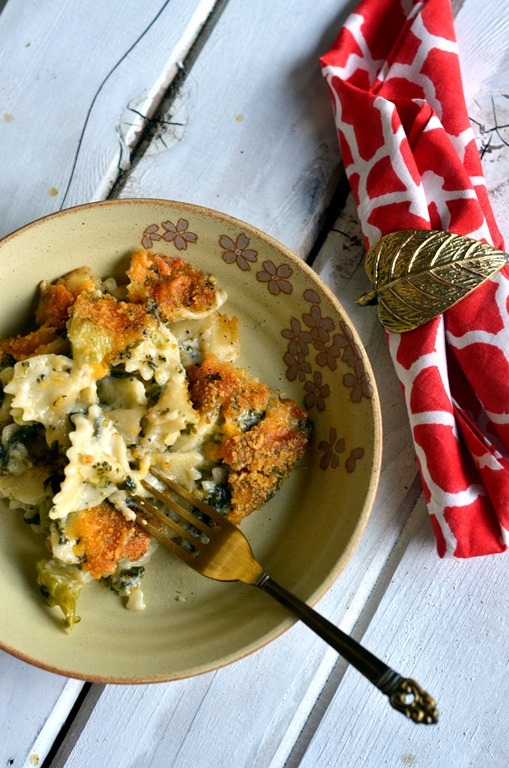 In an oven proof casserole, mix the drained pasta, cheese sauce and sautéed vegetables. 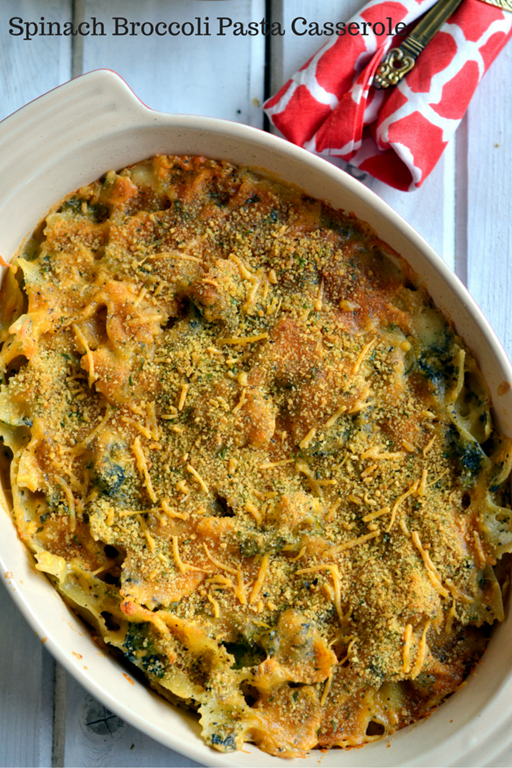 Mix the extra parmesan cheese, bread crumbs and parsley and top the casserole with it. Bake for 20 mins or so, until the cheese starts to melt on top. Tip: To make ahead, do not bake in the oven. 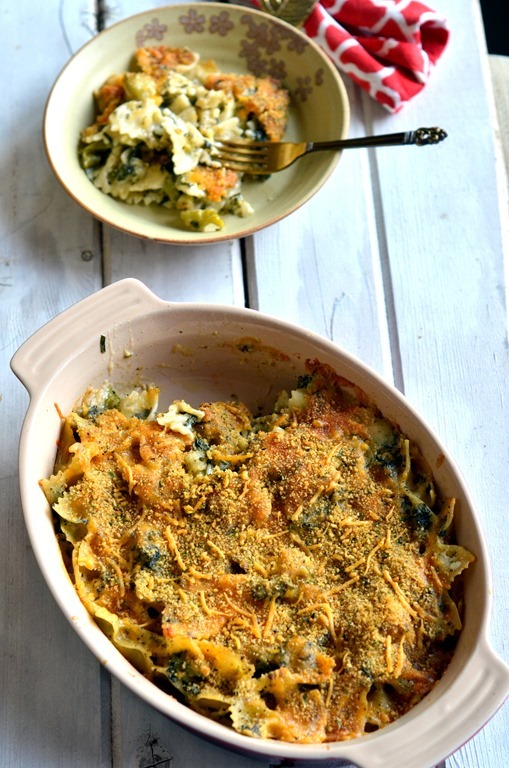 Follow steps till you top the casserole with the cheese – bread crumbs mix and pop in the refrigerator or freezer. Bring to almost room temperature before putting it in the oven. I love how you think, Erin! This recipe is so versatile, you can add some shredded chicken breast to this easily and call it a family meal for everyone, if you wish to. I’m all about the cheesy casserole! This looks amazing, and I love that it’s loaded with veggies 🙂 The pictures are making me drool.